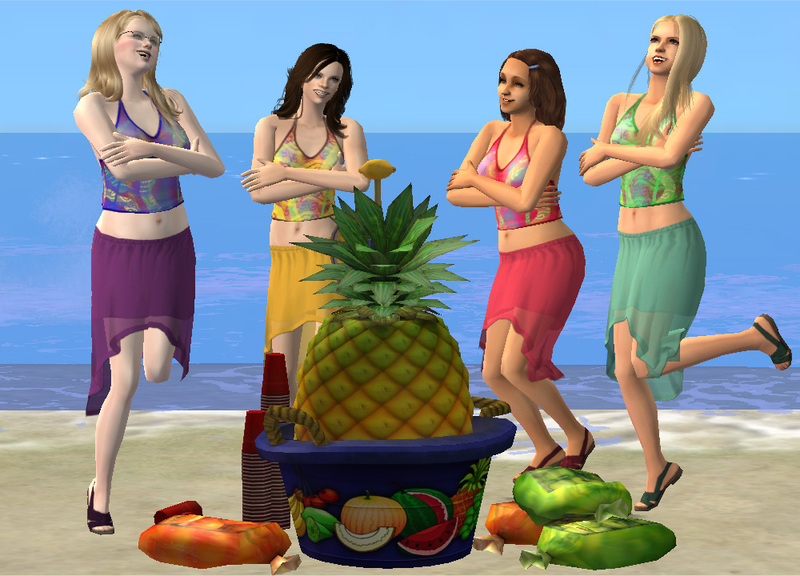 It's a Beach Party with Black Pearl Sims creators . . . I have for you matching separates your Sim can't wait to wear to the next Beach Party (hopefully). I started this project last year when CatOfEvilGenius first put out her HiLo skirt but I could never get the whole skirt to be translucent like the bottom. Originally, I had planned on making matching skirts for most of the Maxis swimsuits so that we could have our Sims looking like they were ready for a day at the beach but I just can't get the skirt to do it, keeps soaking up the skintone when I make it transparent. 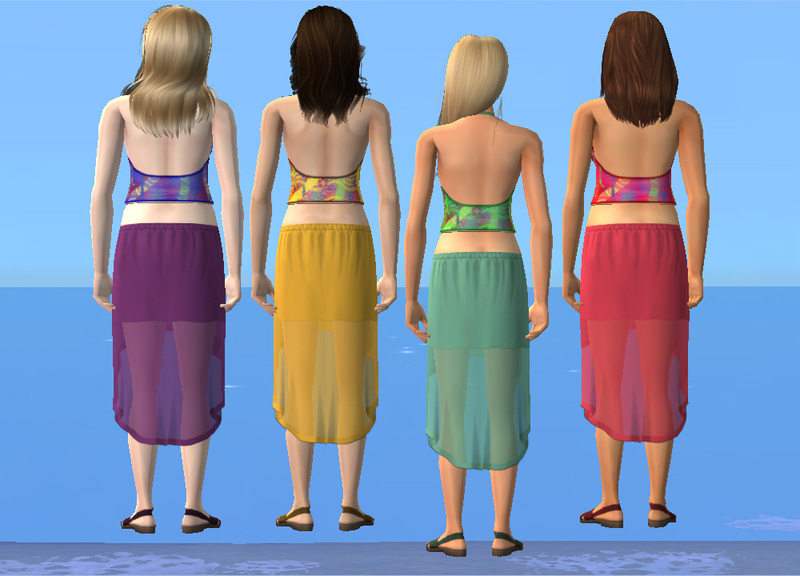 Pictured above are four Maxis suits made top-only with recolors of CatOfEvilGenius' HiLo skirt. The bikini bottoms are not on these since the top edge showed above the skirt; so please, don't use them with a transparent skirt. Next up, the bikini bra from Maxis' black bikini swimsuit made top only. I used the little red bra in sheer black fabric top in the catalog to make these; I believe it's base game since it had no sp or ep logo showing. That was the best mesh match for this part of my project. They are shown with more recolors of the HiLo skirt. There are 16 recolors of each apparel item in Fruit Solids by Mel McCarthy. The tool tips in the catalog will tell you the specific fruit punch color name of each item, the files are marked with the above corresponding numbers. 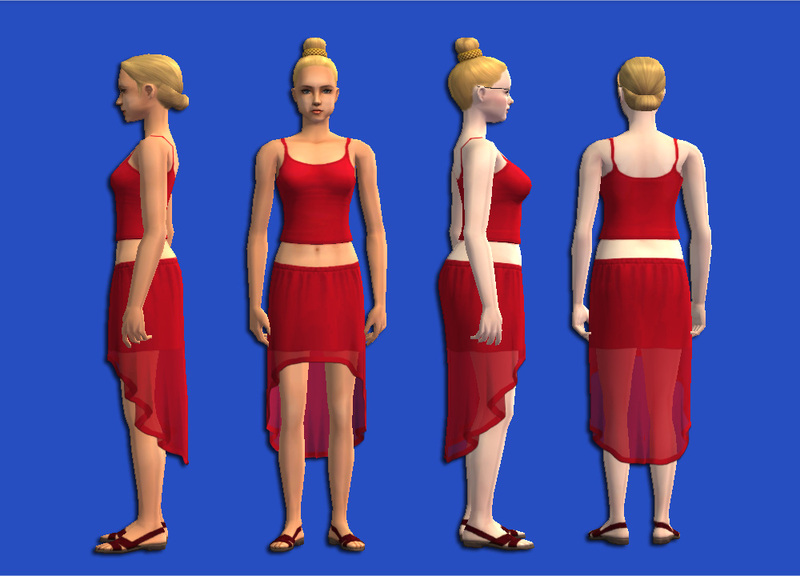 Maxis' tank top separates in 16 fruit punch recolors with matching HiLo skirt recolors. These two sets are part of my original project using CatOfEvilGenius' HiLo skirt. The skull print comes from some free web background place -- had it laying around so long that I don't remember anymore and the flowered skirt I believe is from pattern.com. My game lags horribly when I take screenshots in lots with Sims abiding there so I've made swatches showing all the colors of each clothing from BodyShop. And, no video card so square pixels. In the near future look forward to matching swimsuit/underwear. When I was taking screenshots last night I found a black line along the top of the bottoms and I need to go find the cause of that and get rid of it in all of them. Guess it wasn't just bad shadowing in BodyShop after all. No Sims fell on their heads from the sky during this shooting. ***Updated 1 April 15 with new and improved color swatches from in-game. Cool beans. 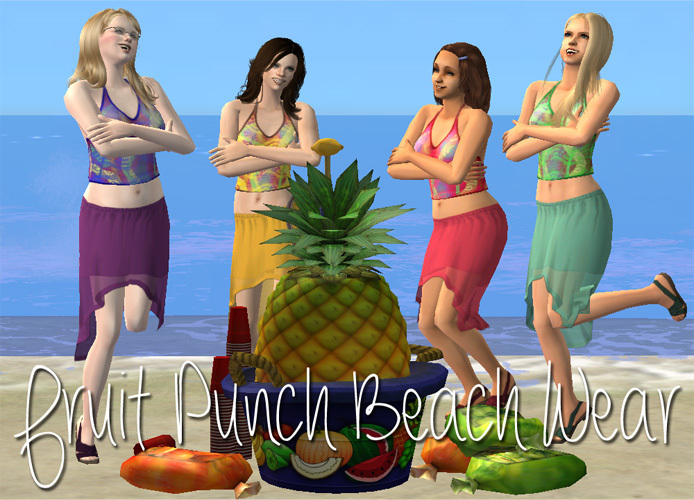 As I said at the start, this Fruit Punch Beach Party features Black Pearl Sims creators as models for the clothing separates. Self-Sims by Kim, Riekus13, 13pumpkin and myself. CatOfEvilGenius for her fantastic clothing meshing skills. Mel McCarthy of MelStampz for the color palette from her Fruit Solids Scrapbooking Paper collection. Made using BodyShop and Photoshop 7. 79 people have said thanks to Deatherella for this download.